1) Essenza di Roma Laura Biagiotti: A sophisticated and refined fragrance with fresh, sweet and woody notes. I'm so addicted to this perfume that I bought it for the second time. 2) Dior Addict Lip Maximizer in Pink: An incredible lip plumper that gives instant volume and shine. I already own the one from YSL and I was ver curious to compare the two product. Needless to say that I prefer the Dior Lip Maximizer since the result is truly remarkable: the lips are fuller and more defined. I can't leave home without it now! 3) Maybelline Baby Lips Balm & Blush in Juicy Rose: A tiny product for both cheeks and lips, to keep in the bag for a little touching up. The packaging is utterly cute and is the reason why I got it; plus, it smells sweet and leaves a nice hint of color. Il lip plumper di Dior funziona!!!! Bella la felpina con Mickey!!! La felpa è carinissima e il rossetto Dior piace tanto anche a me. Insomma Lilli questo weekend mi hai tentato con tutta la tua selezione. The Maybelline lip balm immediately caught my eye! I like the packaging and I'm intrigued by the fact that it's for lips and cheeks at the same time. Sounds really appealing! Have a nice weekend dear! That Mickey Mouse sweatshirt is really darling. I had a similar top when I was younger. I can totally understand why it makes you smile whenever you wear it. I'm loving a few new sheet masks lately. Happy weekend Lilli! 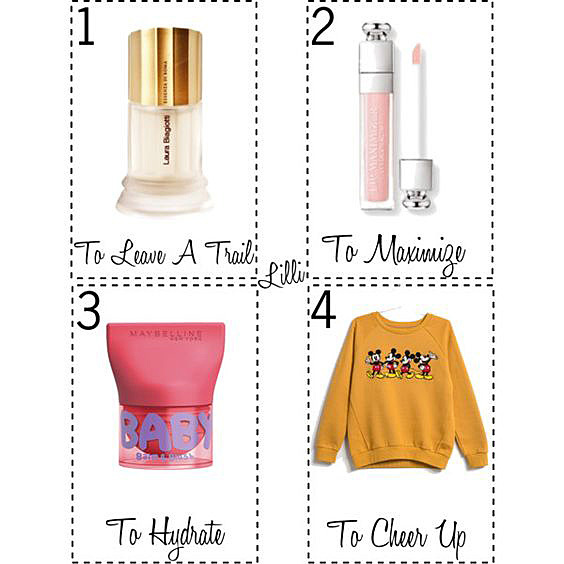 The Maybelline Baby lips and blush seems so practice!And the sweatshirt is very cool in this colorcis ideal for winter, happy weekend Lilli! Dear Lilli. My daughter loves this Laura Biagiotti Parfum too. But I'm not sure, is it because her name is Laura or because she likes the smell. The Dior Lip maximize is in a very soft color. I think this is a nice shade for spring. And no question: the sweater is really cute. Wish you a fantastic weekend you beautiful person inside and out. I totally want to try the Maybelline baby lips balm, i love the package! I have read so much great reviews for the Dior Lip Maximizer. I love the colour pink and the packaging of it. Go for it Lilli. Of course, Mickey Mouse never fails to cheer. Mickey is just adorable! Beautiful pieces; I like that mustard color sweatshirt. Have a great weekend Lilli. Il profumo ce l'ho anche io, buonissimo. Molto carina la felpa! ciao Lilli! Essenza di Roma è favoloso! Voglio anche il lip maximizer Dior! il maglioncino è adorabile, adoro Bershka! Il lip maximizer Dior sarà sicuramente il mio prossimo acquisto! Dior adiict lo tengo, me encanta, es una maravilla de textura, besos,ana.